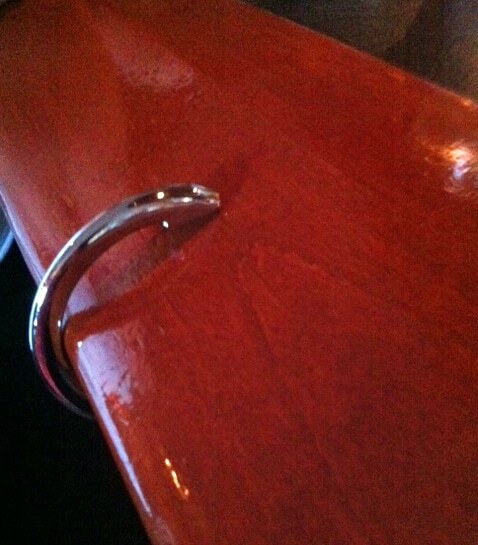 Clipa is unique among handbag hangers for many reasons but one of its underappreciated strengths is arm design. Because each arm is angled, Clipa hangs extremely well, even on beveled tables like this one. Beveled edges are found in conference rooms, bars and some restaurants. Each patented Clipa hook also has non-slip pad on each end. We don’t use ugly black foam that can leave marks on tablecloths or big rubber pads that can degrade over time. Instead, Clipa’s grip pads are clear and very durable so they’ll stand up to years of daily use. In fact, it is not uncommon for a Clipa to outlast the handbag it’s on. So whether Clipa is hanging your new fall bag from a counter with a beveled edge, a vertical bar, or a flat surface, America’s purse hanger won’t let you down. 2019 Topcor. All Rights Reserved.